Wood rot can easily result in costly repairs if not caught and resolved early. An experienced and professional carpenter can thoroughly inspect your home exterior for signs of wood rot or water damage and make any necessary repairs. Any wood that is exposed to moisture is susceptible to rotting and deterioration. Exterior trim is the most susceptible, but window sills, door jambs, drip caps, fascia and any wood near dirt or concrete is vulnerable to damage and decay. We live in a harsh environment. The extent of the damage and rot of the wood directs the course of repair, ARC may replace all or just part of the damaged wood section or utilize an epoxy resin repair. If the wood was improperly installed, needs resealing or needs flashing, it is probably most cost effective to completely replace the rotten boards. If the rot is contained to a small area and full board replacement is impractical, then a wood patch may be possible. In any scenario, you can depend on the detail and cost minded professionals at ARC to install the proper materials with precision and attention to long lasting detail. With proper installation and finishing your new wood will remain solid, functional and attractive for years to come. Attic — An active leak in your roof can allow water to seep in, causing damage and fungal growth.Improperly sealed nail heads or improperly installed vents or fans can leak and cause moisture collection creating the potential for wood rot. Under Sinks — Check under sinks in both the bathrooms and kitchen for leaking pipes. If not caught early enough, an active leak can result in wood rot in the cabinet and sub floor beneath. Basement — Improperly graded landscaping surrounding your home can cause water to collect around the foundation and seep into your walls and basement, where it can saturate structural and surface wood causing rot. Windowsills — Split sealants or failing paint can create conditions perfect for wood rot in windowsills, both inside your home and out. Thresholds — Check for signs of wood rot on thresholds near exterior doors and along wooden door jambs. Steps & Stoops — If your home has wooden steps, or a stoop exposed to the elements and near moist soil, inspect the areas regularly. 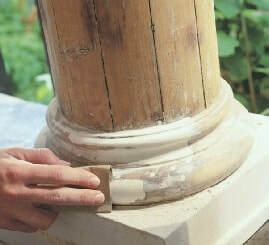 Decks — Look for signs of wood rot on any posts or other parts of the structure in contact with soil. Eaves — Improperly installed roof flashing, a roof leak or clogged gutters create conditions for damage and wood rot. Wood Siding — Regularly inspect this most important part of your home for signs of wood decay. Fences — Check along the bottom of the fence line, including posts and gates.